It’s hard to believe, but when Paslode invented the air nailer back in 1959, nothing much happened. Most professionals weren’t interested. It took 25 more years for air nailers to begin appearing on job sites in a big way, and another decade after that before they became commonplace. But if the power nailer freight train was slow to leave the station, it’s gathered plenty of steam now. Today these power tools are standard equipment, even for many hobbyists and handy homeowners. Pros wouldn’t even think of framing a house, shingling a roof or trimming out a door without something to wrap their trigger finger around. Power nailers are now indispensable and this article goes into details about some of the features that matter. Part of the change comes thanks to innovation. Over the last few years, nailers have become a hotbed of new features and greater reliability. For anyone interested in getting a lot of building done in as little time as possible, the choices have never been better. So what are you building these days? Whatever it is, there are innovative, reliable power nailers to help you work better, work faster and have more fun. Here are a few key things to consider as you make your choice. The world’s first power nailers were built for driving 2 1/2” and 3 1/2” framing nails propelled by compressed air. And while this segment of the nailer category is still a mainstay of the market, significant innovations make these tools easier to use and more productive. The first thing you’ll notice when you pick up one of today’s best air-powered framing nailers is their lightweight. You can thank advanced housings for most of this advance. Bostitch (7.8 lbs), DeWALT (7.5 lbs) are both currently in the lead for the lightest framing nailers going. Most manufacturers offer framers designed to shoot one of two kinds of nails: round-head nails (maximum nail holding power, lower magazine capacity), or clipped-head nails (lower nail holding power, higher magazine capacity). Most power nailers these days use compressed air to drive them. Click here for an overview of the small air compressors on the market right now. Another thing you need to know about is air hoses. You can still buy the heavy rubber type that have been a mainstay of the industry for years, but you don’t have to. Thin, flexible, lightweight hoses bring ordinary air nailers that much closer to hoseless status. 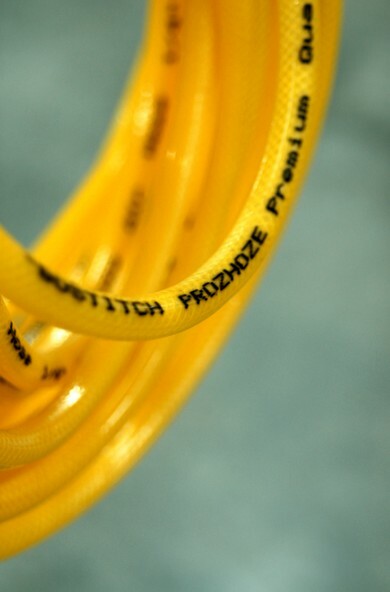 My favourite lightweight air hose right now is the Prozhose by Bostitch. It’s made of thin-walled polyurethane and costs about $1 per foot. Want to get rid of the air hose yet still drive framing nails? Consider a hoseless, combustion-driven framing nailer. These tools pack all the punch needed to drive ring-shank nails up to 3 1/2” long into the hardest wood, without the need for an air hose or compressor. The energy that makes it all happen comes from combustible gas stored in a disposable metal canister. Each canister is good for about 1000 shots and costs less than $10. An onboard, rechargeable battery ignites the gas and powers a fan to clear exhaust fumes. So how come everyone’s not using gas nailers? While they’re handier than air-driven models, they’re not quite as fast. They can also stop working reliably in cold weather as the gas becomes harder to ignite. Paslode pioneered the gas nailer and had the market all to themselves. 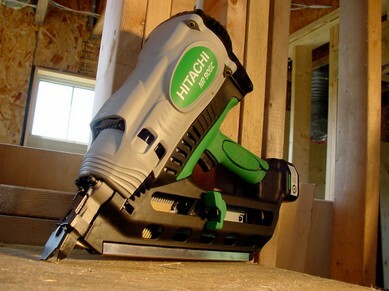 Hitachi upped the ante in the gas nailer game with a gas framer that has soft overwrap handle grips and a faster battery charger. Hitachi guns accept Paslode gas cartridges, the current industry standard. If anyone ever needed a hoseless nailer, it’s when you’re up on a roof banging down shingles. So how come no one makes a hoseless roofing nailer? Speed, that’s why. Over the years several companies have attempted to market a hoseless roofing nailer, but all these tools failed in the marketplace. Professional roofers need to launch rapid, bump-fire volleys of nails as they work, and no hoseless model to date has been able to deliver this performance. Both battery and gas-powered designs require at least a couple of seconds cycling time between shots, and that’s simply too slow for the shingle guys. The best tool companies have been able to do is make their air-powered roofing nailers light in weight, with a big magazine filled with coiled-collated nails. Couple one of the new-generation magnesium roofing nailers with a thin-walled, polyurethane air hose, and you’ve got the best machine that’s currently available. Regardless of which model you choose, remember two things. Be sure to adjust air pressure so nail heads are set flush with the shingle surface. Nails too deep will allow shingles to blow off in the wind. Nail heads too high will damage the shingles that cover them. Also, be sure everyone on the roof wears safety glasses, whether they’re using the nailer or not. Roofing nails are collated with wire that flies around with each shot. Lightweight, air-powered nailers are currently the most common models for driving finishing nails because they’re cheap, they work well, and they’re familiar. And while you won’t regret buying an air nailer for finishing, there’s a question you need to think about. Do you really want to deal with the hassle of a compressor and hose when the biggest reason for tolerating them doesn’t really apply? Framing and roofing are about speed, and in this game you’ve got to have a reservoir of quick-access power stored nearby in the form of a tank full of compressed air. This allows rapid firing in exchange for the hassles of a hose. But finishing is different. It’s at least a little slower than rough work, and that means the slightly slower, self-powered nailers start to make more sense. You’ll find gas-powered finishing nailers that work well, but one of the nicest hoseless finishing nailer technologies is also the youngest. It uses the same rechargeable battery packs that power drills and saws, but in a unique way. In this case the stored electricity is harnessed to power an internal motor that drives nails via a flywheel inertia system. You pull the trigger, hear a whirring sound for a second, then BAM! The nail disappears into the wood. Battery finishing nailers are also quite a bit quieter than gas versions. Until recently, battery finishing nailers weren’t as good as they’re air-powered cousins. Depth of nail control was unpredictable and hard to adjust. But all this has changed. At the moment the 18-volt DeWALT model is my favourite battery powered finishing nailer. It offers precise nail depth control via a side-mounted dial. This level of control is something I haven’t seen on any air nailer yet – air powered or otherwise. The tool drives 300 to 800 16 gauge nails per charge, up 2 1/2 inches long. Few of us have time to spare these days, whether we’re building for money or for the love of it. And while hammers are great and will always be around, it’s hard to pass up the chance to work two or three times faster while maintaining all the same quality. This is the power nailer advantage. The only you’ve got to wonder about is why it took so long to catch on? There’s enough power nailer innovation on tool store shelves right now that it can make your head spin. Start your nailer quest with this 30,000-foot view of the field. The lightest models weigh less than 8 lbs. A big part of power nailer innovation shows up in the form of specialized nailers for specific jobs. You probably won’t use many of these tools all the time, but when the need comes up, it’s good to know there’s help. Palm Nailers: Also called an impact nailer, this air-powered tool was invented by Danair in 1967 and currently offered by DeWALT, Porter-Cable, Senco , Stanley Bostitch and others. All models operate in the same way. Fit a framing nail into the hollow, tubular nose piece, press the nail into place onto wood, then let the air-driven oscillations push the nail into place like a hot fondue skewer into chocolate. Slower than regular nailers, but the low profile lets you sneak fasteners into places where you can’t even swing a hammer. Pin Nailers: These tools drive very thin, 23-gauge headless fasteners into wood. Ideal for small trim installation, especially when used in conjunction with glue. Fasteners are virtually invisible when the gun is adjusted to drive pins flush with the wood surface. Made by Porter-Cable, Stanley Bostitch and others. Joist Hanger Nailers: A thin-nosed tool for rapid-fire installation of nails that anchor metal hangers. Much faster than hammer-driven nailing. Building Wrap Nailers: an exclusive from Hitachi, this tool shoots a single, collated box-type nail into the centre of a plastic washer that’s fed from a collated roll. Speeds the installation of building wrap and other flexible sheet material by about 75%. Lube the washer-feed mechanism with WD-40 after installing each new roll of washers for best results. Honking-Big Nailers: Stanley Bostitch offers the largest air nailer you’re likely to ever need. Capable of driving collated spikes 6 inches long. The new GMC battery-powered All-Nailer is a gun-style impact nailer that drives ordinary nails up to 6 inches long.